We just love video. We know you that you do too. If you need video for your marketing projects we can help. We have a variety of solutions available that can be posted to YouTube, Vimeo or even used for television broadcast. You can then use these videos in your email marketing or on your web site. Some of these solutions simply use stock footage and animations and require little more than your logo to get you an amazing result. We also offer instructional whiteboard video creation. We can even assist you to create screencast videos or work with you to create live streaming events. Video is climbing to the top of social media channels in terms of engagement and reach. You now need at least one quality video to feature for your Facebook and YouTube channels, then you need to learn to use live streaming and easy tools that you can create with in-house to continue to leverage your video presence. We'd like to help you with all of that so you can have an edge over your competitors. The cost starts at $500 for slideshows, instructional video presentations and stock promotional videos with 9-12 scenes. These are suitable to use as featured videos. That's a ballpark figure, but we want you to have some idea of what's involved. We can coach your team through live streaming and in-house video creation for as little as $200 a session. Contact us today with your ideas, we'll get right back with you and explore your options. Web site traffic and sales don't magically happen. We think of it like a tree. Want to understand how it all fits together? 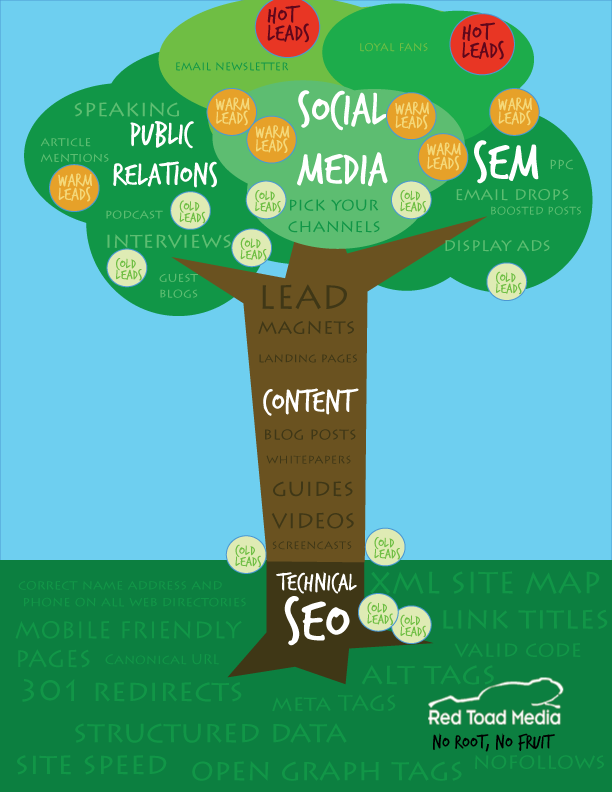 Read all about how search engine optimization, search engine marketing, social media and public relations work together here.